Facebook phone, is it? IS IT? Something big is coming from Facebook next week - or so we infer from an invite the the social network has been sending out for an event at its San Francisco HQ. 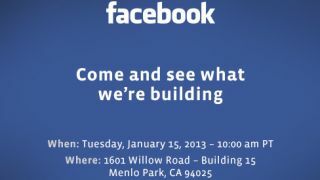 "Come and see what we're building," the invite reads, getting the internet's collective tongue wagging about possible Facebook hardware. Could the 'book be double bluffing on the whole Facebook phone thing? Is Zuckerberg taking the network the way of Amazon with a Facebook tablet on the cards? Of course, it could be that Facebook is simply 'building' some new profile features intended to appease investors and eke money out of its one billion monthly active users. The Facebook phone is the rumour that won't die, however - even Mark Zuckerberg's protestations that it would be "the wrong strategy" failing to quiet murmurings that HTC is working on hardware for the company. Either way, the present tense used in the invite implies that whatever it is that Facebook's cooking up isn't quite ready yet. TechRadar will be with Facebook on Tuesday evening so stay tuned to see what the network has up its sleeve - we'll bring you the news as it breaks.